With few opportunities for input from those most impacted, NYC has sold 202 city-owned lots to developers for $1 each since Mayor Bill deBlasio took office on January 1, 2014. There are 41 city-owned lots still pending final sale for $1. 596 Acres made this tool so New Yorkers can know what’s happening to our public land. 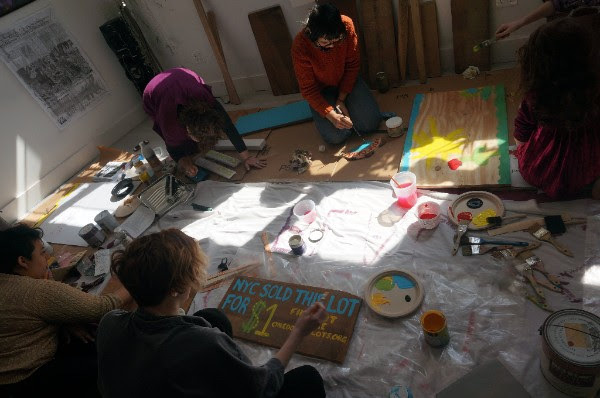 We found out about these $1 sales (the government calls them “dispositions”) though folks who were organizing, with support from us, to transform long-languishing vacant public land into inclusive community spaces that would benefit their communities. During their work, organizers would all of a sudden find out that the City planned to sell this land to a housing developer for $1. Click the About link on the top left of the map to find a summary of our data-gathering methodology, tips on how to use the map, credits and other information. Get our raw data here. What Will Happen to The Dollar Lots? Only one of the 202 lots sold for $1 will be permanently affordable housing (because of advocacy). For the rest of them, affordability expires: the majority of units developed/preserved under Housing New York are required to meet income restrictions for 20 to 60 years (source). After affordability expires, the buyers will be the folks who determine how the land will be used. Across all sold lots, 4 for-profit housing developers, 6 non-profit housing developers, and 36 “for-profit/non-profit groups” all purchased different amounts of land from the City for $1 per lot. “For-profit/non-profit groups” refers to situations where a for-profit and non-profit co-own the land with the for-profit poised to benefit from the public land subsidy. Note that non-profit housing developers may not necessarily serve the community well, but the land they buy could at least potentially end up in the hands of mission-driven charity organizations rather than speculators who financially benefit as they make the city less and less livable to the same people who give it value. The key takeaway is: there is no guarantee that any of these private owners will keep the spaces affordable. To really guarantee long-term affordability and shared public benefit from invaluable public gifts, the City could prioritize selling cheap land to community land trusts and other not-for-profit owners specifically established to preserve permanent affordability and local self-determination. The City could also offer other public subsidies and incentives–those that make the Housing New York Plan possible–to these types of organizations. Or, the City could keep public ownership and offer long-term leases to local stewards instead, making sure the public maintains control over what happens to land and buildings for the long haul. Public land for public good! How’d Our City Get Scattered with Vacant Public Lots? These vacant city-owned lots that have been sold for $1 are vacant due to decades of institutionally racist government land use policies including settler colonialism, redlining, and Urban Renewal Area clearance. Many of these public lots languish in the middle of active blocks primarily in low-income neighborhoods of color, and they exist for years fenced off by the government but otherwise not maintained. Fast forward to 2014, and the City has been selling them without input from the people who have long dealt with the real life impact of abandoned land in their lives. This squanders potential opportunities for transforming historical violence, and for creating lasting, adaptive public benefit. 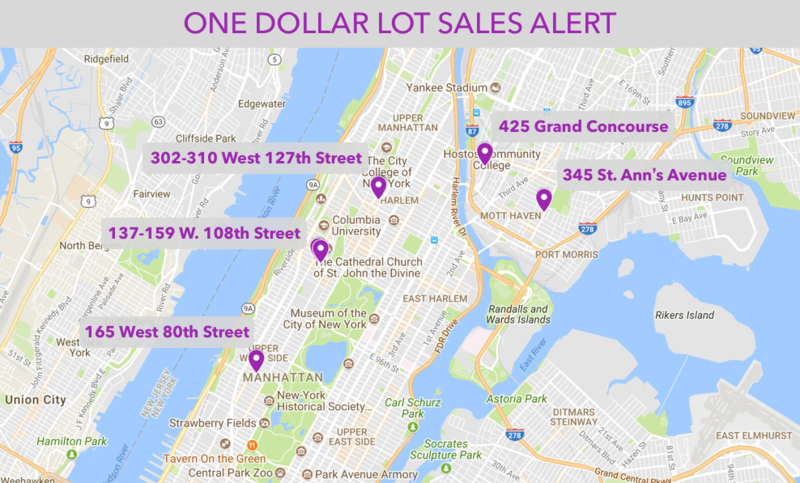 One dollar lot sales have historically helped groups of organized neighbors in NYC fight their displacement and create the permanently affordable places they need and desire. Cooper Square Committee’s long-range organizing to create deeply- and permanently-affordable housing in the East Village–along with forever cultural spaces out of 30 formerly city-owned buildings–is just one example. Their commitment to preventing displacement and preserving existing housing turned them into housing developers and managers (source)! As capital (public and private), subsidies and other forms of outside investment finally arrive to places that have been resource-deprived due to historically racist land use policies, dollar sales provide an opportunity to change course; people who have survived the years of disinvestment could use public resources like land subsidies to stabilize the communities that they invested in when no one else would. 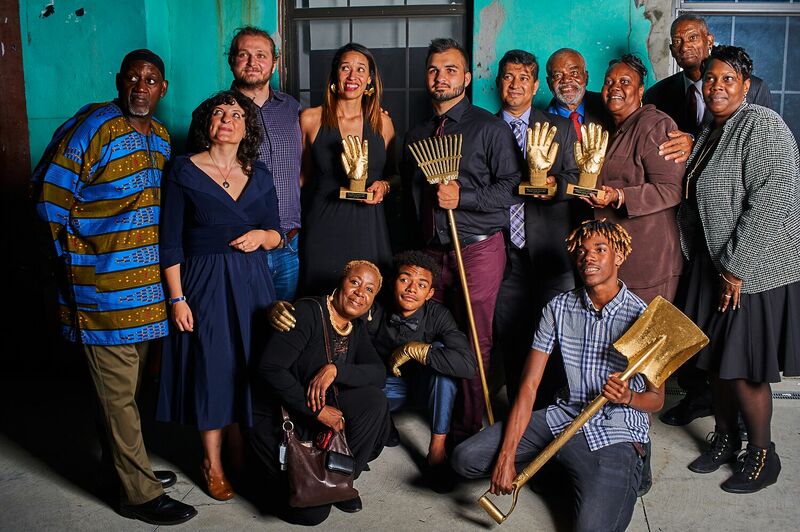 The City could invite this, and make sure local community leaders have access to accurate information, relationships, and other resources that would allow them to realistically plan, renovate, develop, and manage their spaces for shared local benefit. Post offices, libraries, armories, NYCHA campuses… Learn about other public assets at risk of being sold to outside investors at NYCommons. Check out the lot page for the vacant public lot in your life for information, and click organize to sign up for updates, at Living Lots NYC. Want to change how dollar sales are impacting your neighborhood and city? Contact us at 596 Acres, and we’ll continue the conversation: organizers@596acres.org and (718) 316-6092.